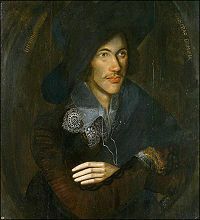 Another post on the Interesting Literature website, this time about my favourite poet, John Donne. Claiming Donne as my favourite poet is a bold call as I love many poets but I can remember loving his poetry at high school &, if a poet can survive Year 12 English classes, he's a keeper. It was difficult to choose one of the ten featured at Interesting Literature as I love them all but I've chosen The Canonization, which combines Donne's religious poetry & his love lyrics in one. Just to make life complete, here is Richard Burton reading the poem. Richard Burton has been on my mind this week. I've been listening to Adam Sisman's excellent biography of John le Carré (read by Michael Jayston) & I was interested to hear about the experience of turning le Carré's novel, The Spy Who Came In From the Cold, into a movie. The movie starred Richard Burton. Burton wanted Elizabeth Taylor to be cast as his love interest but the role went to a much more suitable Claire Bloom. Bloom had worked with Burton before & they had been lovers so Taylor was jealous (Bloom's character's name even had to be changed from Liz to Nan), Burton didn't get on with the director, Martin Ritt, & the experience of filming was fraught. Maybe they should have spent more time reading poetry? Alas, alas, who's injured by my love? What merchant's ships have my sighs drowned? Who says my tears have overflowed his ground? Add one more to the plaguy bill? And we in us find the eagle and the dove. By us; we two being one, are it. So, to one neutral thing both sexes fit. A pattern of your love!" Isabel Dalhousie is a philosopher. She lives in Edinburgh, she's wealthy (she bought the applied ethics journal she edits when it was under attack from rivals), married to Jamie & the mother of three year old Charlie. All these advantages worry Isabel, even though she is philanthropic, kind & always ready to help anyone in need, especially when their problem has a moral or ethical dimension. Isabel's relationship with her niece, Cat, is another source of worry. Cat is not much younger than Isabel & was once involved with Jamie. This hasn't helped their relationship & Cat, who is a prickly woman, takes offence very easily while also presuming on Isabel's good nature when she needs help. Cat also had terrible taste in men & has just gone off to Paris for a weekend with the latest man, leaving Isabel to help out in her delicatessen at short notice. Isabel's social prejudices are on show when Eddie tells her that Cat's new boyfriend is a dishwasher repairman & is then surprised by his knowledge of art & poetry. She also has to adjust her ideas about a colleague, Professor Robert Lettuce, who has made her professional life very difficult. She discovers that Lettuce is in line for a senior post at the Enlightenment Institute at the University of Edinburgh which disconcerts her. However, after meeting Lettuce's wife, Clementine, & finding out a little more about the man & his motivations, she has to reassess her instinctive dislike of a man she has considered a personal enemy. When a friend of Isabel's asks her help for a neighbour, Isabel agrees to meet the woman, Kirsten, who's concerned about her son. Seven year old Harry has begun talking about another life, his "other family", & his mother is worried about his mental stability. Kirsten has recently separated from her husband so is Harry's preoccupation with another family just a reaction to the separation or is it really evidence of reincarnation? Isabel agrees to look into it even though she's profoundly sceptical about reincarnation. Harry's memories of the house he lived in are very specific & Isabel decides that a possible location is near a lighthouse on the Ardnamurchan peninsula. What Isabel discovers when she visits the house seems to put Harry's memories down to chance but that isn't the end of the story. It's taken me a while to get around to reading this latest instalment in the Isabel Dalhousie series. I seem to be reading fewer & fewer modern novels & I've stopped reading several authors for whose new books I was always first in the reservation queue. Although I borrowed this when it was published last year, I took it back unread. A couple of weeks ago, I suddenly decided the time was right & then sat down & read it in one sitting. I like Isabel, the Edinburgh setting, her musings about Scottish art (she visits Guy Peploe's gallery this time & looks at an exhibition of Colourists), the visits of Brother Fox &, this time, the visit to the west coast of Scotland. I'm afraid Isabel's endless worrying & musing drives me a little crazy & I can't help wondering that if she had less money & had more to do, she wouldn't have time to endlessly debate the ethics of her own & everyone else's motives. But then, she is a philosopher & that's what she's like - there, I'm dithering just as much as Isabel! I also find Jamie a bit of a cipher - handsome, kind, endlessly supportive, great cook - but Isabel seems a little less inclined to question their relationship in this book. I was also interested in the reincarnation theme. I've always been fascinated by reincarnation. As well as reading lots of time-slip novels over the years, I've also read quite a few more serious books on the subject, including the ones by Ian Stevenson that Isabel mentions. It's one of those subjects, like the existence of ghosts, that can never really be proved one way or the other although there are certainly some very convincing stories about both phenomena. As a rational person with a leaning towards scientific explanations of the world, Isabel finds reincarnation hard to believe but she's open minded enough to do some research as she pursues her investigation. 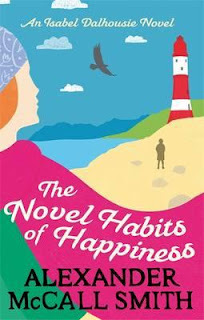 The Novel Habits of Happiness was an enjoyable way to spend a cool summer afternoon & with the enticing hook of a new plot development at the end of the novel, I'll look forward to the next book in the series. Another article from the website Interesting Literature led me to this poem by Henry Wadsworth Longfellow about rain. It's called The Rainy Day & contains the famous line, "Into each life some rain must fall." 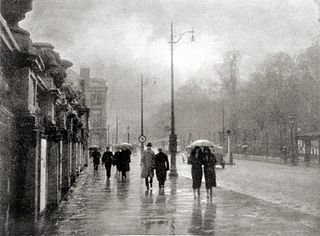 I love rain & at this time of year, when I'm hoping that autumn is not too far away, it was lovely to read the many different ways poets have looked at rain. Longfellow seems fed up with life until the very end when he hints at returning sunshine. The beautifully atmospheric photo is from here. Cathbad is house sitting for a friend, Justin, who lives in a house next to St Simeon's in Walsingham. As well as the house, Cathbad is also looking after Justin's cat, a defiant black tom called Chesterton. 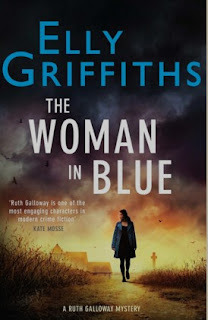 When Chesterton escapes one night, Cathbad follows him through the churchyard & sees a woman, dressed in white & wearing a blue cloak, standing next to a tombstone. As Walsingham has been a site of pilgrimage for worshippers of the Virgin Mary for centuries, & Cathbad is a druid, unfazed by spiritual experiences of any kind, Cathbad is not afraid but interested. Next morning, though, the body of a young woman, Chloe Jenkins, dressed in a white nightdress & blue dressing gown, is found carefully laid out in a nearby ditch with a rosary on her chest. Cathbad's vision was all too real. Chloe was a patient at The Sanctuary, a clinic for people with addictions. She was a beautiful, blonde young woman, a model who had become involved with drugs & spent several periods in clinics trying to overcome her problem. DCI Harry Nelson & his team soon discover that security at The Sanctuary wasn't particularly rigorous & Chloe wasn't the only patient who had slipped out that night. Harry is also disconcerted by the resemblance of Chloe to his wife, Michelle, & their daughters. Harry's marriage had been shaky for a while when Michelle discovered that Harry had had a brief affair with archaeologist Dr Ruth Galloway & that he was the father of her daughter, Kate. Harry wants to be part of Kate's life & Michelle agrees that he should but her own unhappiness has become more apparent, especially as she has become emotionally involved with Tim Heathfield, one of Harry's team. Ruth is surprised to be contacted by Hilary Smithson, who she knew when they were both post-graduate archaeology students at Southampton. Hilary's career has changed course & she is now a priest. She's going to be in Walsingham at a course for women priests with ambitions to become bishops. Hilary has been receiving disturbing anonymous letters, addressing her as Jezebel & abusing her & all women priests as unnatural. Ruth convinces Hilary to show the letters to Nelson & soon there appears to be a link with the murder of Chloe Jenkins when one of the women on the course, Paula Moncrieff, is also murdered. Both Chloe & Paula were blonde & attractive, both killed in Walsingham. Could there be more of a connection? Could the same killer be responsible? There seems to be a religious theme - the rosary left on Chloe's body & the fact that Paula was a priest. Nelson & his team find clues in the past & in the connection of both women to Walsingham. The action spans the weeks from early spring, when the snowdrops cover the ground in the ruins of Walsingham Abbey to the performance of the Passion Play on Good Friday when everything becomes clear. I love this series. The relationship between Ruth & Nelson is just wonderful. Ruth has had several inconclusive relationships since Kate was born but she really seems to be in limbo, unable to forget Nelson, despite the tenuousness of their relationship. Nelson is also torn between Michelle & Ruth, wanting to do the right thing & not hurt anyone but continually wrong footed & mostly making himself miserable. Nelson discovers that Michelle has been seeing Tim in a very dramatic scene that results in a reconciliation of sorts with Michelle. Ruth's life as a working mother isn't easy. Her boss, Phil, is still irritating & she feels inadequate as a mother, although Kate is happy, healthy & has lots of friends. Cathbad & his partner, Judy, now have two children & are very content, although Judy is anxious to get back to work in Nelson's team as soon as her maternity leave is over. It's so lovely to find out what's been happening with Ruth, Nelson, Cathbad & their families. Nelson's Sergeant, Dave Clough, is as enthusiastic & as clumsy as ever & there's a new member of the team, Tanya Fuller, who tries a bit too hard & gets on Nelson's nerves because she isn't as empathetic as Judy. The suspects are a reliably creepy lot with potential motives all over the place. As in the best mysteries, hardly anyone is quite what they seem & everyone has secrets. The religious & historical themes are also fascinating & there's even an archaeological angle as Ruth investigates the results & the finds from a couple of digs that took place at the abbey in the past, looking for the site of the holy house where pilgrims came to worship a phial containing the Virgin's breast milk. My only problem with this series is that I read them so fast (less than two days for this one) & then have to wait a year for the next book. I couldn't even wait for my library copies to arrive & bought the eBook on the day it was published. It's the mark of a great mystery if I read it that fast so I'll just have to sit tight & wait for the next instalment. I was sorry to read about the death of Margaret Forster last week. I've always enjoyed her books, several of which I enjoyed listening to in the audio books read by Susan Jameson. I particularly loved her memoirs, Hidden Lives & Precious Lives, about her family. She was passionate about the importance of ordinary lives & her books explore the secrets that every family keeps. Although a very private person, Forster put a lot of her own experiences into her novels. I had no idea that she had suffered from breast cancer in the 1970s when I read her novel, Is There Anything You Want?, set in a cancer clinic & interweaving the stories of the women who go there. It was only in her last memoir, A Life in Houses, published last year, that she described her experiences, especially the haven that her home became as she recovered from treatment. After reading about Forster's death, I remembered that I'd bought Kathleen Jones's short biography of Forster some time ago & hadn't got around to reading it. It was originally written as an Arts Council commission & subsequently updated a few years ago. 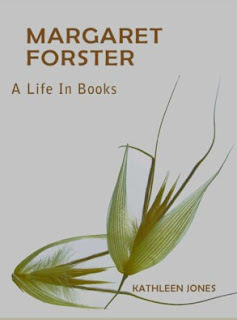 It's an excellent introduction to Forster's work, discussing all her books up to The Unknown Bridesmaid in 2013 as well as a biography. It also includes the covers of all the books & I loved seeing the very trendy 1960s cover art for her first novels, Dames' Delight & The Bogeyman. Kathleen Jones has paid tribute to Forster on her blog here. I was also fascinated to read how she decided to write biography, especially her biography of Bonnie Prince Charlie, The Rash Adventurer, which I haven't read, & her biographies of Elizabeth Barrett Browning & Daphne Du Maurier, which I loved & would love to reread. There were many obituaries but here's the one in The Guardian & an interview from Cumbria Life in 1999. I also listened to her appearance on Desert Island Discs in 1994 which can be heard here or downloaded as a podcast. She disliked music & preferred silence so her musical choices were surprising & quite moving as they were all pieces that reminded her of family or special times in her life. Forster's husband, Hunter Davies, is a writer & journalist, famously writing several books about the Beatles. She chose Blackbird because it reminded her of that time in their lives & Send in the Clowns because her daughter used to play it on the clarinet on summer evenings. There's one more Margaret Forster novel to look forward to. How to Measure A Cow will be published next month. 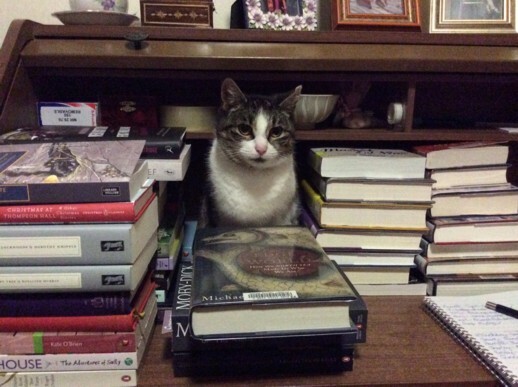 I love this poem which combines books & cats. It's Pangur Bán, a poem written by an Irish monk in the 9th century. It was discovered written on a manuscript & celebrates the life of a scholar monk & his cat, Pangur Bán. 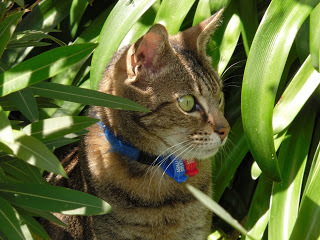 I came across this poem again recently at a website called Interesting Literature, in a post about 10 classic poems about cats. I've signed up for the regular emails from the site which highlights interesting facts about a writer or a poem. This translation of Pangur Bán is by Eavan Boland. Anthea Logan has spent the last seven years trying to live down the scandal of her brother's imprisonment. Randal Logan was a chemist who sold secrets to the Communists (I assume the Soviets although it's never actually mentioned). Anthea left her job as a journalist to look after her devastated mother & took a teaching job. Living in a miserable flat, working in an uncongenial job, trying to keep up her mother's spirits & ashamed of her brother's crime, Anthea couldn't feel more defeated by life. After her mother's death & the release of Randal from prison, Anthea is determined to change her life. Randal disappears overseas, after visiting Anthea to borrow money, & Anthea leaves her job & decides to have a bit of a spree. She buys a car, some good clothes & books a few days holiday at Balgarvie House, an expensive hotel in the north of Scotland where she spent the last happy days of her life before Randal's disgrace tainted everything. Anthea's arrival at Balgarvie House causes some consternation. It's a sporting hotel, owned by the local laird, Colonel Garvie, & a single female guest who isn't interested in stalking, hunting or fishing is a mystery. Anthea remembers Balgarvie & especially the harbour as a tranquil place where she truly felt at home. She has relations at the Manse, the Minister, Walter McNaughton & his family, but they've lost touch. Anthea's real dream is to buy or rent a neglected croft near the harbour known as the Tully. She's less than pleased to hear that it's been sold & that the owner is the man she fell in love with years ago, John Gregorson. Anthea & Greg had fallen in love over the Bach Double Concerto but he had broken off the relationship because he wanted to pursue a career as a writer. Then, the scandal had broken, Anthea left her job at a newspaper & effectively disappeared with their relationship & their feelings for each other unresolved. Now, here he is, a successful writer, living in the croft she had hoped to own & it's impossible to avoid him. The hotel guests are a mixed bunch. A couple of Frenchmen, an American Senator with his secretaries or bodyguards, Mr Peachey from the Foreign Office & his friends Vida & Bryce Carruthers & Lawrence Vine & his parents. Anthea also gets to know the students who spend their summer working at the hotel, including her cousins Ian & Ness McNaughton & Morgan, a waiter with a presumptuous manner who no one, except Ness, much likes. When a letter of Senator Cleever's goes missing (dropped in the garden by his secretary Chet Hart while talking to Anthea), Anthea's connection to Randal Logan is revealed & she comes under suspicion of stealing the letter. Anthea realises that she will never be free of the taint of association with treason if she, helped by Gregorson, can't find out what really happened to the letter & the money that is subsequently stolen from Anthea's room. I really enjoyed The Road to the Harbour. I love books set in Scotland & I've been collecting the Susan Pleydell reprints from Greyladies without actually reading any of them. Then, Desperate Reader mentioned Susan Pleydell in her Top 10 of 2015 & said that this book, which she'd just read, was already a contender for this year's Top 10. First published in 1966, it reminded me of books by Catherine Gaskin (her books are becoming available again as eBooks) or Mary Stewart that I loved when I was a teenager. Beautiful, independent young woman with a problem to solve or a worry that's preventing her from getting on with her life, usually in an exotic location that's as much part of the story as the plot & characters. There's always a romance, & I enjoyed Anthea's romance with Greg very much. His dog, Dan, is delightful (& I'm not a dog person) & the picture of the village, with the harbour & the Tully is just beautifully done. The mystery plot isn't dramatic but the combination of circumstances - Anthea's past, her ambiguous status at the hotel, her run-ins with the Carruthers, Morgan & Ness, her relationship with the McNaughtons & with Greg - combine to put her in a very uncomfortable position. It was a really absorbing read. 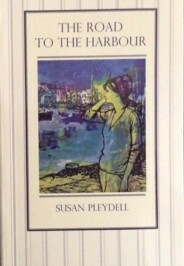 Some of Susan Pleydell's books are available in the US from Anglophile Books. This poem, The Storm Cone, was one of Kipling's last poems, written in 1935. He had seen & written about many wars, from the Sudan to South Africa & the Great War & was horrified at the signs of growing German militarism. 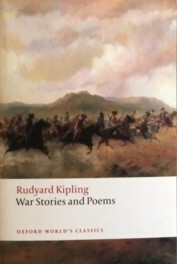 I've been reading this volume of war stories & poems & have just started Kipling's autobiography, Something of Myself, which is proving interesting for what he's not saying about himself. One reviewer apparently called it Hardly Anything of Myself! I will definitely need to read a biography afterwards to fill in the gaps. Can anyone recommend a good one? I've heard good things about the Andrew Lycett; I enjoyed his biography of Arthur Conan Doyle. Delude us-dawn is very far. As though we don't all have more than enough to read, here are some more temptations to put on our wishlists or recommend to our local library. Head of Zeus 2016 - The new publisher of Diney Costeloe whose books I've reviewed here in the past. Diney's backlist is being reprinted with gorgeous covers & sometimes a change of title. I reviewed The Ashgrove (now called The Lost Soldier), Death's Dark Vale (now called The Sisters of St Croix) & Evil on the Wind (now called The Runaway Family). They also have a new imprint, Apollo, reprinting past classics that have been forgotten. I'm especially interested in My Son, My Son by Howard Spring, an author I've never read but who was incredibly popular in the early 20th century. Other authors include Eudora Welty & Christina Stead. Pan Macmillan 2016 - Reprints of Lillian Beckwith, Winston Graham (his non-Poldark historical novel, The Grove of Eagles) & Robert Barnard with retro covers in the style of the immensely popular British Library Crime Classics. Vintage 2016 - Adrian Tinniswood's new book, The Long Weekend : Life in the English Country House 1918-1939; Juliet Nicolson's memoir A House Full of Daughters, & new Vintage Classics editions of The Edwardians, Pepita & All Passion Spent by Vita Sackville-West. Bloomsbury 2016 - Lovely non-fiction books that caught my eye include Bitter Taste of Victory by Lara Feigel, Jacobites by Jacqueline Riding, Guilty Thing (a biography of Thomas De Quincey) by Frances Wilson, Landskipping by Anna Pavord & Highlands : Scotland's wild heart ( the book of a TV series narrated by Ewan McGregor) by Stephen Moss. British Library - including the details of the next batch of British Library Crime Classics & Mike Ashley's Adventures in the Strand : Arthur Conan Doyle and The Strand Magazine. A few more literary links & interesting articles. An article in The Spectator about the recently rediscovered novels of Stella Gibbons & a recent review from Desperate Reader. 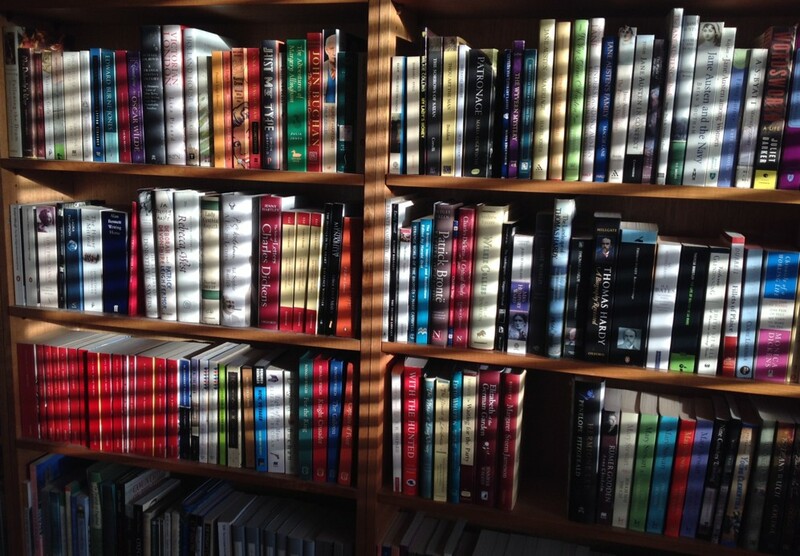 Issue no 8 of Shiny New Books has just gone live with reviews of new books, reprints & the winners of their recent poetry competition. A terrific article by Hilary Mantel about the work of Elizabeth Jane Howard with interesting things to say about the way that women writers are still discussed in terms of their looks or their private lives rather than their work. It reminded me of the furore last year over an obituary of Colleen McCullough that emphasized her weight & her looks (or the writer's perception of her looks) rather than her achievements or her intellect. Mantel has written the Introduction to a Vintage reprint of Elizabeth Jane Howard's The Long View. Lots of anniversaries this year. 200 years since the birth of Charlotte Brontë, 400 years since the deaths of Shakespeare & Cervantes (will this be the year I read Don Quixote? ), 75 years since the death of Virginia Woolf, 100 years since the birth of Penelope Fitzgerald, 150 years since the birth of Beatrix Potter & the publication of a long lost story, Kitty-in-Boots. The Guardian has a list of books to look out for & even more anniversaries here. I feel exhausted but excited just thinking about all those books to read & anniversaries to observe! 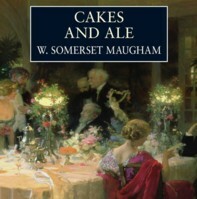 I've always known that Somerset Maugham lampooned Hugh Walpole in this novel, Cakes and Ale, but I didn't realise that he also used many recognisable aspects of the life of Thomas Hardy as well. Hardy died in 1928, only two years before this book was published, & the critics were shocked at Maugham's irreverence. 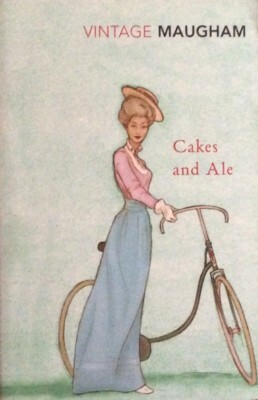 After reading Walpole's Rogue Herries last year & being reminded of the scandal, I wanted to read Cakes and Ale, which, of course, has been sitting on my tbr shelves since 2011. Hugh Walpole's reputation never really recovered from his portrayal as Alroy Kear. He even wrote a letter to Maugham, asking why he had betrayed their friendship, & signed it Alroy Maugham Walpole. In his satirical portrait of literary society, Maugham also pokes fun at critics, society painters & literary hostesses. The book is very funny but I can understand why Walpole (& Hardy's widow, Florence) was so upset. The portrait of Alroy Kear is absolutely wicked & made Walpole a laughing stock. William Ashenden is a moderately well-known writer. His friendship with Alroy Kear is intermittent & Kear usually only contacts him when he wants a favour. So, an urgent phone call from Kear asking him to lunch raises all his suspicions. Kear has been asked by Amy Driffield, widow of the famous Grand Old Man of English letters, Edward Driffield, to write a biography of her husband. Amy is summed up in one beautiful phrase, "Mrs Driffield looked as though she had taken a dose of castor oil and had just been trying to get the taste of it out of her mouth by sucking a lemon." Kear is a popular middlebrow novelist, an expert at self-promotion & flattery. He remembers that Ashenden knew Driffield when he was a boy, when Ashenden lived in the country town of Blackstable with his uncle, the vicar. Driffield was also a local boy & was married to his first wife, Rosie, who had been a barmaid. Kear wants Ashenden to write down his reminiscences but it soon transpires that only the facts & anecdotes that portray the literary lion in the making will be required. Rosie will be quietly airbrushed out of the story, an embarrassing mistake. The Edward Driffield who ran away to sea, enjoyed singing vulgar music hall songs & married beneath him will have no place in the official Life. The request makes Ashenden suspicious as he knows exactly the kind of hagiography that Kear will write. Edward Driffield married Amy, who had been his nurse when he had pneumonia, when he was already an old man. She was much younger, very respectable & determined to make Driffield respectable too. Ashenden remembers his friendship with the Driffields. As a teenager, home for the summer holidays, he first met them out cycling & they taught him to ride. His uncle disapproved of Driffield, who has only published a few disreputable novels. Nevertheless, young Ashenden continues to see them during his school holidays until he is shocked by the news that they've skipped out one night, leaving debts everywhere. The locals suspect that "Lord" George Kemp (the local coal merchant, called "Lord" because he gave himself airs), one of Rosie's admirers, has helped with the flit. I looked at Rosie now, with angry, hurt, resentful eyes; she smiled at me, and I wish I knew how to describe the sweet kindliness of her beautiful smile; her voice was exquisitely gentle. She put her arms around my neck and pressed her lips against mine. I forgot my wrath. I only thought of her beauty and her enveloping kindness. 'You must take me as I am, you know.' she whispered. I don't know if Hardy refused to take a bath for the last three years of his life or if he liked to sing vulgar music hall songs but this is how Ashenden describes Edward Driffield. There are lots of parallels with Hardy though. The lower-class, embarrassing first wife; the much younger second wife who produced an official biography (actually written by Hardy himself); the scandal over the death of a child in one of his novels; the long old age at Fern Court (Hardy's Max Gate), the house in his old home town that the author had always wanted to own; the parade of younger authors & critics clamouring to visit the Grand Old Man of Letters in his last years; the fuss over the funeral arrangements with the establishment wanting a grand ceremony at Westminster Abbey against the author's wishes. Driffield is an elusive character. We never really know what he thinks about Rosie's behaviour. He seems content to be in the background. Rosie dominates the scene as she must do because we see her through Ashenden's recollections. Speaking of audio books, I listened to Cakes and Ale read beautifully by James Saxon.